Come for the free trial. Stay for the indomitable spirit you'll unlock. To register for a one-week FREE trial of our Taekwondo programs, fill out the form below! Why 1: Confidence is everything. We help build young strong well balanced individuals. Confident in themselves and prepared to deal with life challenges. To be successful in life you must find balance. The struggles and hardships students face throughout their journey to black belt will inoculate them to the stresses of life off the mats. Why 2: Life is about making the right choices. Must teach students how to overcome fear and self build confidence. Tae Kwon Do is a great venue to teach those benefits. As martial artists we will all encounter our fears, and quickly come to realize that they are what stands between us and progress toward our goal. Through learning what makes us tick and why, we can apply the lessons we learn to overcome such fears in all avenues of life. With enough self discipline we can discern what we want to do, formulate a plan, and stick to it until we achieve success. Tae Kwon Do teaches us how to subvert our desires today, to reap the rewards in the future. Why 4: A strong spirit dwells within a strong mind, and a strong body. Tae Kwon Do is not only a great form of exercise, but also a constant measuring stick for our progress both physically and mentally. Tae Kwon Do provides immediate feedback, you will feel that pizza you ate, the donuts for breakfast, every time you train. Conversely, you will see and feel the results of your good choices in you technique, and it will help you stay on the path toward feeling healthy and fulfilled. Everything is easier with a strong community behind you and a group of like-minded friends. No matter what your goals or the particulars of your journey are, your classmates will be walking the path alongside you. Your instructors will be walking ahead, lighting the path. If you slip, as we all do, your classmates will be there to offer empathy, compassion, and share their own struggles to keep your spirits high. Your instructors will be there to keep you accountable, remind you of your goals, and help you come up with a plan to get back on track. Translated, Taekwondo means the art of kicking and punching. The Korean art form combines the direct lines of Karate, the circular motions of Kung Fu with native kicking techniques into a formidable self-defense art form. Chicago Martial Arts Taekwondo classes, training and principles are firmly rooted in the eleven commandments of modern Taekwondo. 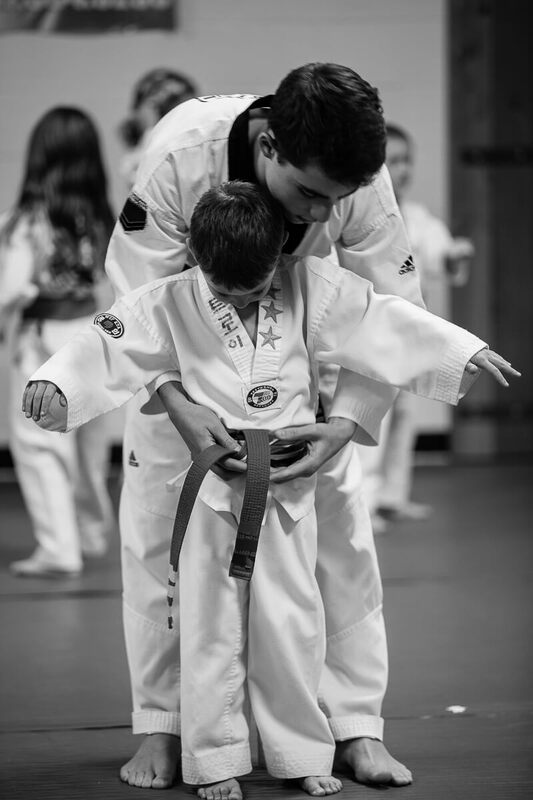 Chicago Martials Arts takes a balanced approach to Taekwondo, focusing on the mind, body & soul to provide balance and breed self-confidence while maintaining a healthy respect for those around. Classes are available for all ages, children and adults, and are dependent upon the level of the student’s skill and technique. Students who dedicate themselves to the training should expect to see improved strength, cardiovascular endurance, control of daily stress, weight management & flexibility. For more information on how to sign up for the Taekwondo Classes, please contact us or stop by at either of our Chicago area locations.